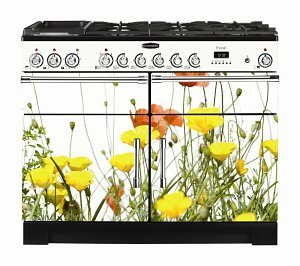 The Floral Collection is the first ever printed cooker range from Rangemaster; colourful, fun and super stylish, the eye catching designs will really create a fabulous statement in any kitchen. 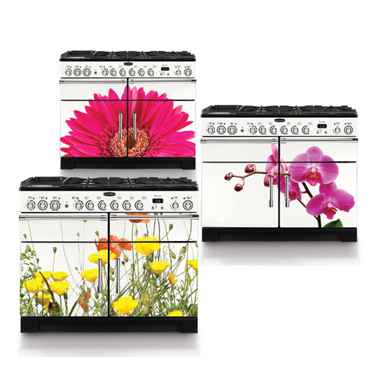 The new designs are printed onto the front of Rangemaster’s versatile Excel 110 range cooker and include The Orchid, The Gerbera and Wild Flowers (in our picture). 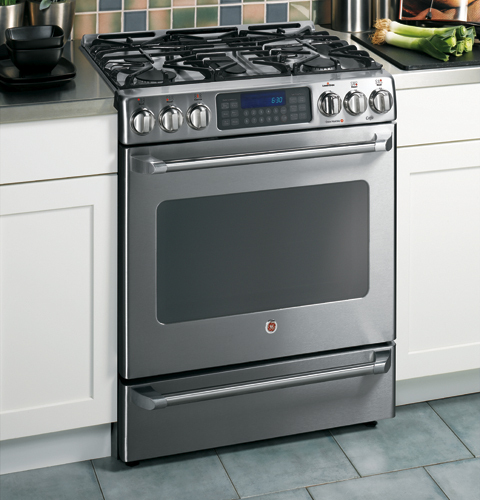 The free-standing HSB 745 A55 E stainless steel gas range cooker has the appearance of a top-class appliance. Elegant proportions, a functional look and the satin shine of solid stainless steel make this cooker an eye-catcher in every open-design kitchen. With two multifunctional electric ovens and 100 cm in width, the design of this stand-alone gas range cooker meets professional requirements. Metallic bar handles, metal-coloured clamp handles and a large display with clock and timer add to the professional look. 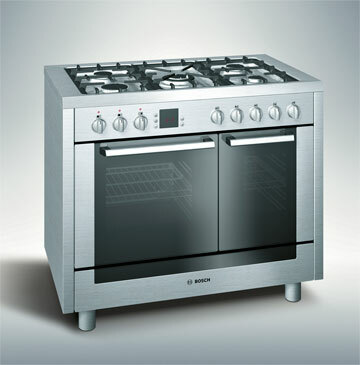 This spacious oven with several heating systems is suitable for preparing food in a variety of ways. Simple meals can be prepared or dishes kept warm in a small oven with top and bottom heat. Both ovens have viewing windows and metal applications. The stainless steel hob with four burners and a wok burner for Asian food enthusiasts is equipped with cast-iron pot supports. red dot award: product design 2007. Five burners and two ovens… a formula for success for anyone pursuing the passion for cooking. This powerful, yet flexible range offers an 18,000 BTU dual stacked burner for both power boiling and precise simmering at temperatures as low as 140 degrees. 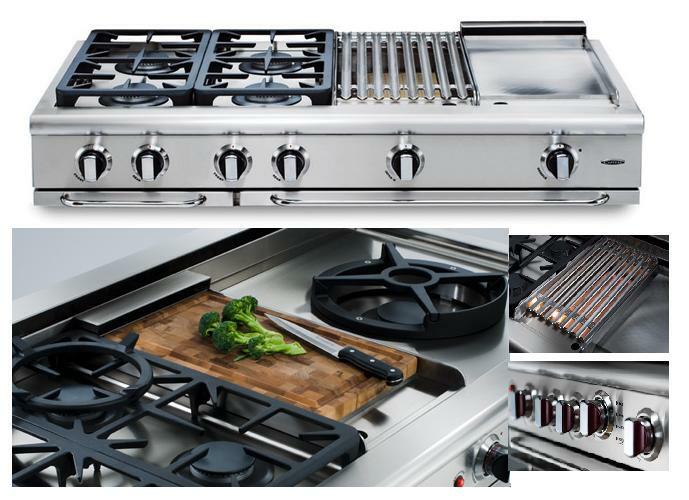 The cooktop also includes a 17,000 BTU burner, precise simmer burners and a fifth oval center burner with an integrated griddle accessory. Down below you’ll find an extra-large self-cleaning oven cavity with precise air convection, as well as a lower baking oven that can also act as a warming drawer. GE Appliances. This 30″ modesl features four Insta-Geat high-wattage radiant elements: one 6″,1,200 watt element; one 7″,1,800 watt element;one 8″, 2000 watt element;one 9″/6″, 2400 /100 watt element. The gas-ceramic surface frameless design and easy grasp pull-off control knobs deliver stylish good looks and quick after-dinner cleanup. Well designed, modern and great performance. Maytag . 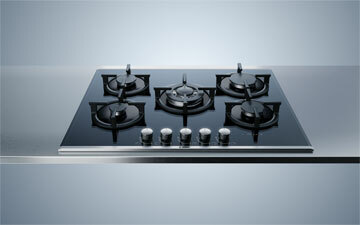 The PHL 206 HEU 70-cm gas-fired hob has an innovative, eye-catching design. 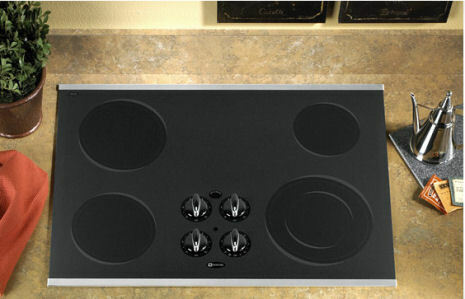 Five burners with individual cast-iron pan supports are mounted onto black-coated, tempered glass with facetted edges at the side. Behind a front panel of brushed aluminium, rotary knobs provide a high degree of operating convenience. It is simple and easy to remove spilled food from this functional and tempered glass hob. red dot award: product design 2007. 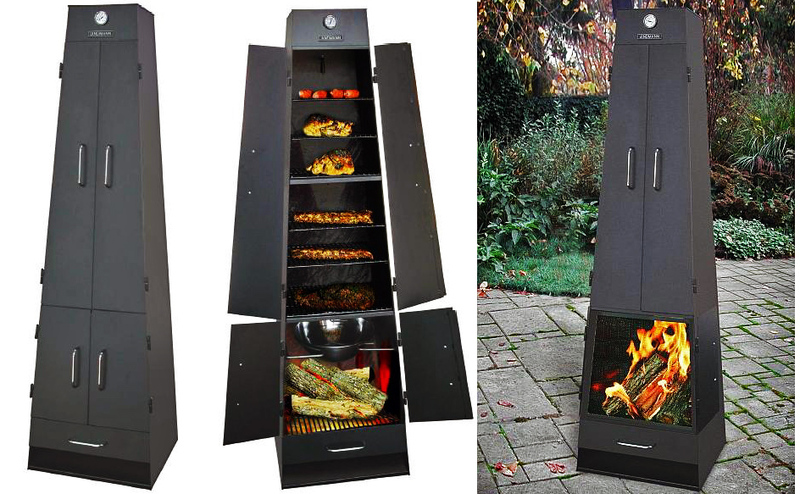 The one of a kind QuadQue Charcoal Grill and Outdoor Fireplace is unique, flexible and has achieved award winning results in food competitions. The QuadQue can be used as a grill, smoker, steamer or an outdoor fireplace. Heavy duty steel construction means the QuadQue is sturdy and built to last. Six porcelain cooking grates add up to a large 1,370 square inches of cooking space. 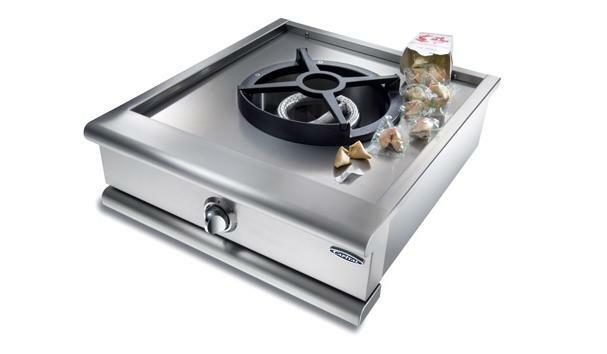 Includes Stainless steel handles and temperature guage, this amazing grill also has meat hangers for cooking or smoking, an ash drawer for easy clean up and a front spark guard when used as a fireplace. QuadQue Charcoal Grill burns wood or charcoal and is quite possibly the last grill you will ever have to buy. Cannon cookers have always been a symbol of excellence in the kitchen, with a reputation for a superb heavy construction. Chesterfield gas cooker comes in a contemporary silver coloured finish with a combined grill, double oven and a gas hob with protective glass lid and 4 burners. Features of this freestanding digitally programmable include enamel pan supports, double glazed oven doors, 3 oven shelves, programmable clock, an internal light to both cavities, LED display and roasting dish. An LPG conversion kit is included. Unleash the ancient art of Asian cooking with the powerful Stainless Steel Power-Wok. With state of the art burner design generating 35,000 BTU’s of searing power, exclusive grating system that accommodates, small, medium or large woks, and even stock pots, it’s the perfect complement to your perfect outdoor kitchen. 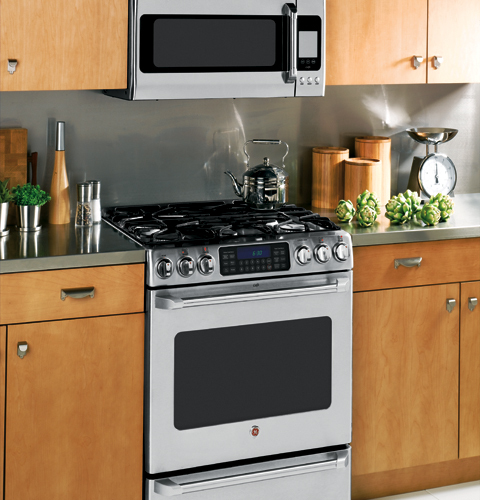 AEG-Electrolux offers Hobs which are stylish and easy to clean. They are perfectly formed & the advanced Touch Control combines complete safety and precision at your fingertips. With bevelled edges and smooth touch controls giving a sleek finish, AEG-Electrolux’s Hobs will enhance the appearance of any kitchen. 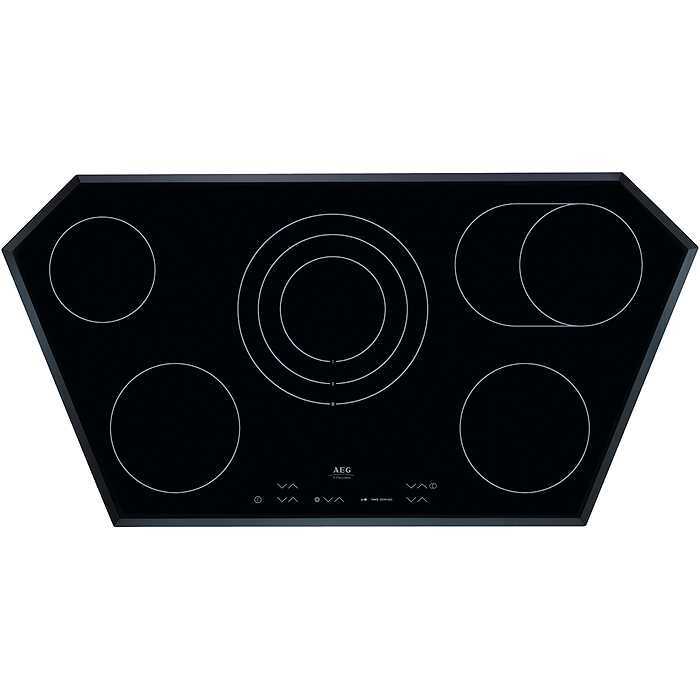 The AEG 96910KFE-N Ceramic Hob has 5 zones in a choice of polygon or rectangular shapes for a practical and modern look.